CC – Combined Chlorine – CC over 0.5ppm indicates a problem. 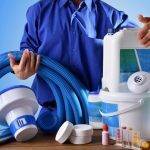 Combined chlorine is an intermediate breakdown product created in the process of sanitizing the pool. CC causes the “chlorine” smell many people associate with chlorine pools. If CC is above 0.5ppm, you should SLAM your pool. CC indicates that there is something in the water that the FC is in the process of breaking down. In an outdoor pool, CC will normally stay at or near zero as long as you maintain an appropriate FC level and the pool gets some direct sunlight. PH indicates how acidic or basic the water is. PH should be tested daily at first. Once you gain experience with your pool, less frequent monitoring may be appropriate, depending on your pool’s typical rate of PH change. A PH level of 7.7 and 7.8 is ideal, but really anything between 7.2 and 7.8 is doing fine, while levels between 7.2 and 8.0 are acceptable for swimming. Calcium hardness indicates the amount of calcium in the water. Over time, water with low calcium levels will tend to dissolve calcium out of plaster, pebble, tile, stone, concrete, and to some extent fiberglass surfaces. You can prevent this from happening by keeping the water saturated with calcium. In a vinyl liner pool there is no need for calcium, though high levels can still cause problems. A plaster pool without a SWG should have CH levels between 250 and 350 if possible. With a SWG, CH should be kept between 350 to 450. Calcium helps fiberglass pools resist staining and cobalt spotting. If you have a spa you might want to keep CH at at least 100 to 150 to reduce foaming. Cyanuric acid, often called stabilizer or conditioner, both protects FC from sunlight and lowers the effective strength of the FC (by holding some of the FC in reserve). The higher your CYA level, the more FC you need to use to get the same effect. It is important to know your CYA level so you can figure out what FC level to aim for. If you don’t have a SWG, CYA is typically kept between 30 and 50ppm. If you have a SWG, CYA is typically kept between 70 and 80ppm. You increase CYA by adding cyanuric acid, often sold as stabilizer or conditioner. CYA is available as a solid and as a liquid. The liquid costs a lot more, and generally isn’t worth the extra expense. Solid stabilizer is best added by placing it in a sock in the skimmer basket. 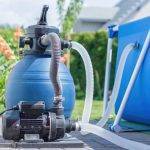 The pump should be run for 24 hours after adding solid stabilizer and you should avoid backwashing/cleaning the filter for a week. Test and dose chemicals in your pool assuming the amount of CYA added is in the pool according to Poolmath. CYA can be tested the day after it is fully dissolved from the sock. Salt is required with a SWG. Salt can also be added to the water to enhance the subjective feel of the water. For a SWG, check the manual for the correct salt level for your unit. This level will typically around 3,000, but different models vary. For improved water feel without a SWG, try levels around 2,000ppm. These levels are less then one tenth of the salt level in ocean water, which has around 35,000 ppm of salt. People vary in their ability to taste low levels of salt. A few people can taste salt levels as low as 1,000ppm, others not until 3,500ppm or more. Borates are an optional enhancement that helps control PH drift and provides various subjective water quality/feel improvements. If you are not intentionally using borates there is no need to test for them. When using borates, the recommended level is between 30 and 50 ppm.